Thank you to Lanny, the Scarecrow Committee, and all the volunteers who made this year's contest amazing! Check back later for the results of the contest and pictures. If you are interested in chairing or volunteering for this event next year, please fill out form below. 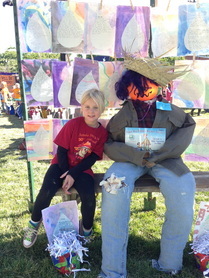 Jessie Beck's 35th Annual Sensational Scarecrow Contest is just around the corner! For those new to Jessie Beck, this is a long-standing tradition, fun for the whole family as well as the community. 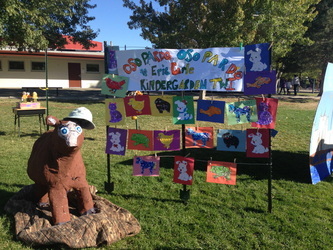 Students, families and other schools are invited to make scarecrows that are judged for 1st, 2nd and 3rd place cash prizes. 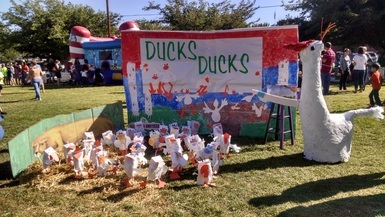 Jessie Beck classrooms compete for traveling trophies. The event also includes carnival games, raffle, food, soft drinks, cotton candy, sno cones, popcorn, pies, photo booth, Yossen's Fire on the Mountain Pizza Truck, and of course, Jessie Beck's famous pumpkin-shaped cookies. Cuddles the Clown will be making free balloon shapes for the kids. 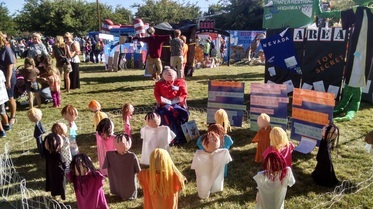 Scarecrows are on display from 1:00-5:30pm. We hope you will consider designing and building a scarecrow as an individual group or family project for our 35th event. Who knows, your scarecrow might be the winner of a cash prize! Print, fill out and return entry form to Lanny. ​Raffle tickets are $1.00 each or $5.00 for 6 -- fill out the form and turn into Lanny Hershenow with your payment to purchase additional tickets. If you want to purchase extra raffle tickets, please print, fill out and return the form below (please remember to include payment) to Lanny Hershenow. PARTICIPANTS: Students (Individual and groups) K-8 may enter. Middle School entries will be put in the 4-6 categories. Families may also enter. Classroom entries will be in a category of their own. 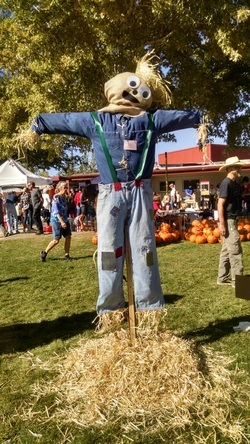 TRADITIONAL: These scarecrows will be typically old-fashioned figures constructed from throw-away items from the "farm". Clothing, hay stuffing, burlap, farm implements, farm produce (cornhusks, vegetables, etc.) are a few ideas of the traditional scarecrow. HUMOROUS: These scarecrows should be humorous looking. Cartoon figures, crazy characters, and soft sculptures. OTHER SCHOOLS: Other school entries can be traditional, humorous or a book character. They will be judged in the K-3 and 4-6. SET-UP: A metal stake will be provided for each scarecrow if needed. The builder of the scarecrow must provide material for securing the scarecrow to the stake. 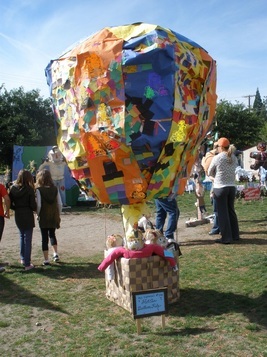 MATERIALS: As all scarecrow entries must remain on display out-of-doors and may be subject to bad weather, their construction should be durable. ELECTRICITY: As no electricity is available for scarecrows, you must provide your own power source (no power generators, please). 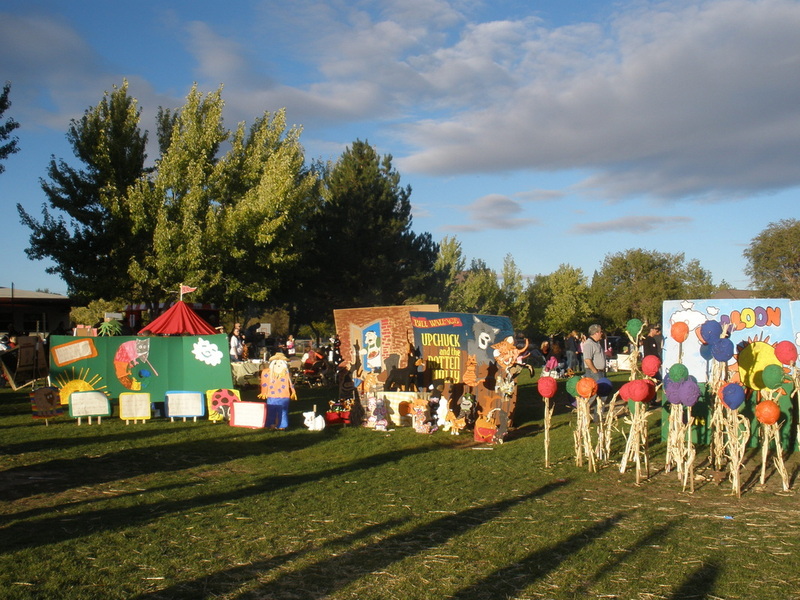 ALL PARTICIPANTS READ: The Principal, scarecrow committee and/or judges at Jessie Beck reserve the right to reject any scarecrow if the theme depicts violence or any other inappropriate content. NOTE: We are not held responsible for damage or theft during the contest at Jessie Beck. DELIVERY OF ENTRIES: Entrants must check in at the registration table before setting up their scarecrows. Entrants may bring their scarecrows between 8AM-12NOON on Friday, October 14, 2016. Someone will be on hand to assist entrants in locating designated posting sites and to help with scarecrow set-ups. JUDGING: Judging will take place at approximately 1:30PM on Friday, October 14th. Award ceremony will be held at approximately 4:30PM. SCARECROWS MUST BE REMOVED BETWEEN 5:30-6:00PM CONTEST NIGHT. Last year's event was a huge success! Thank you to all the volunteers and supporters for making it special! Congratulations to our 2014 Sensational Scarecrow Contest Winners! 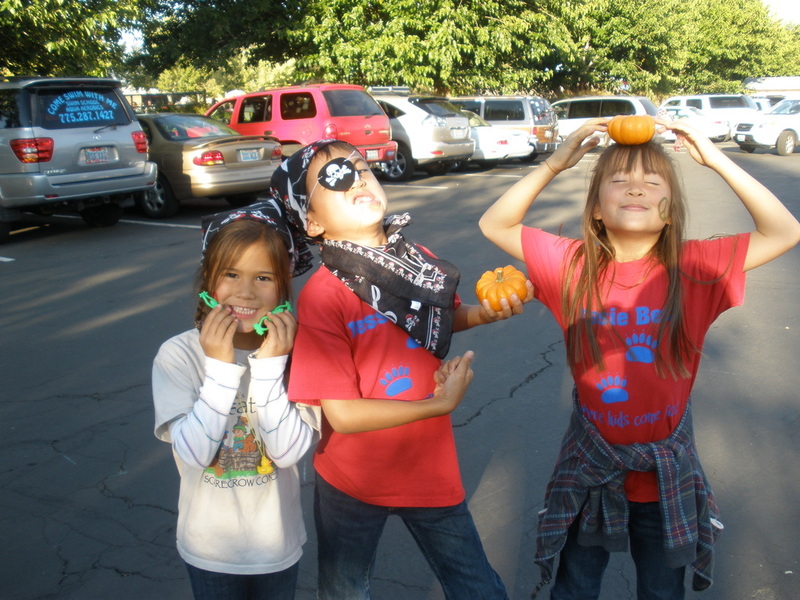 Jessie Beck kids having a blast!